Friday March 6th 2009 was a very special day for the Rural Communities in Central & Southern Mayo. The Tóchar Valley Rural Community Network launched a new Way-Marked way. The Croagh Patrick Heritage Trail, a 61-kilometre trail that starts in the town of Balla in Central Mayo and meanders all the way to the village of Murrisk at the base of Mayo’s holy Mountain, Croagh Patrick. The Launch was carried out by an t’Aire Eamon O’Cuív, Minister for Community Rural and Gaeltacht Affairs. The Ceremony took place in Balla Community Centre amongst a large crowd marking the culmination of many years of hard work and endeavour by a partnership of communities, local landowners and a host of key state and semi-state organisations. The Croagh Patrick Heritage Trail is deemed to be a high calibre quality trail that now joins the catalogue of other prestigious trails in County Mayo. So what is special about the Croagh Patrick Heritage Trail and how did it come about? 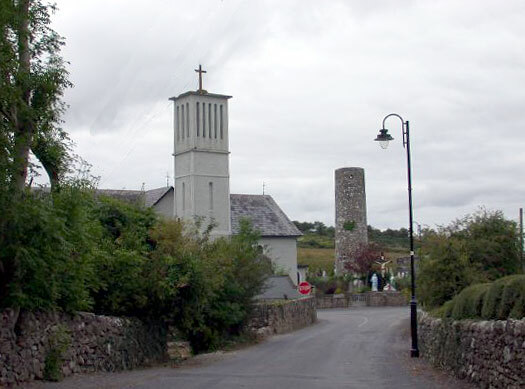 The Tóchar Valley Rural Community Network is a network composed of representatives from community councils from the following 18 communities: Aughagower, Balla, Ballyvary, Ballyglass, Ballintubber, Ballyheane, Belcarra, Brackloon, Drummin, Carnacon, Clogher, Hollymount, Islandeady, Killawalla, Manulla, Mayo Abbey, Murrisk, Partry and Tourmakeady. In the mid Nineties a survey carried out in Co Mayo by Dr Jim Frawley, of Teagasc Rural Economy Research Centre, showed that only 7% of Mayo farmers at that time were viable and highlighted the importance of off farm income. Responding to the results of the Teagasc Survey the Board of the Network set out to research the various sources of off farm income available to the local farmers in the Tóchar Valley. The board of the network concluded that a trail or walk acting as a spine starting in Balla and finishing in Murrisk would be the ideal catalyst to stimulate diversity in income generation. After 10 years of endeavour and leading a magnificent partnership the 61 km trail had now become a reality. The Tóchar Valley Rural Community Network is delighted and very proud of their achievements. The Manager of the Network Sr Maureen Lally stated “The trail is a product that is the essence of partnership we did not do it in isolation. We worked very closely with the local landowners who were excellent in their generosity and understanding. Without them we would not have a trail today. Llikewise, we got tremendous support from Mayo Co Council, South West Mayo Leader Company, The Rural Social Scheme, County development Board, FÁS, The National Trails Office, The Irish Sports Council. The Way Marked Way Advisory Board, The VEC, Mayo Vocational Educational Committee, Fáilte Ireland and Gno Mhaigh EO, all of whom played a key role within the partnership”. Now that the Croagh Patrick Heritage Trail is in place we are glad to announce a three day walking festival along the trail commencing on Saturday the 14 March 2009. The first leg on Sat 14 Mar runs from Balla to Killawalla - 25km. The 2nd leg on Sunday 15 March from Killawalla to Aughagower, and the final leg on Monday 16 March from Aughagower to Murrisk (20Km). The Festival will commence with a welcoming event on Friday evening March 13th in the Westport Country Lodge, Aughagower, and end with the presentation of certificates at Murrisk Community Centre on Monday evening 16 March 2009. The Trail is an exciting journey passing through deciduous woodlands across rolling hills and raised bog in the communities of Balla, Belcarra, Clogher, Killawalla, Aughagower, Brackloon, Drummin, and Murrisk. It also wanders down boreens and ancient pathways as it makes its way through a number of picturesque villages towards its final destination on the shores of Clew Bay. The Trail is at the heart of rural West Mayo. It includes outstanding heritage sites and many features of great natural beauty. Services such as accommodation, food & transport links are available along the route. We hope this community driven initiative will serve as a powerful inspiration and source of encouragement and hope for other rural communities in these economically challenging times.